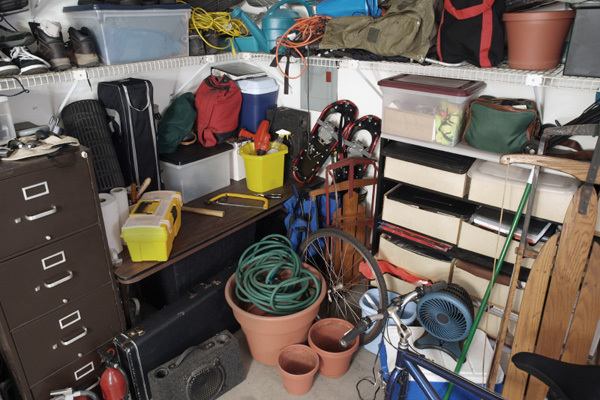 Does clutter make you anxious, or is it comforting to be surrounded with your things? When it comes to decluttering your house, do you ever want to just throw in the towel (preferably on the floor) and stop trying so hard? Maybe a little clutter is a good thing. After all, is life really better when we sort, color-code, and neatly stack everything in clearly labeled plastic bins? Or is an uncluttered life not worth living — antiseptic, alienated, a Stepford home that feels like nobody really lives there? Clearly, mounting clutter stresses some folks. A UCLA study shows that cortisol (stress hormone) levels in women rise in sync with the amount of clutter in their homes. Yet some people love their clutter and think a full house is akin to a full heart and an active brain. Lifestyle coach Jolanda Molenaar says that if you love the items around you, and you don’t feel overwhelmed, then clutter is a nonissue. Teenagers, we know, seem happiest when sweaters and dirty dishes litter their bedroom floors. And when parents pick their battles, the clutter hill is not one many moms choose to die on. Some adults hate clutter, but seem helpless to corral it. They turn to $150/hour professional organizers who crack the whip and force them to toss old photo albums and even the trophies that junior got for merely showing up to the pee-wee championship soccer tournament. But I find that the more chaotic my insides, the more I must simplify and organize my outsides. Unfortunately, my clutter bug husband is the opposite; when he’s most stressed, clutter soothes him, like a security blanket of stuff. If I get him to organize the garage, is that a fair compromise? How about you? Are you a neat-freak or a clutter aficionado?